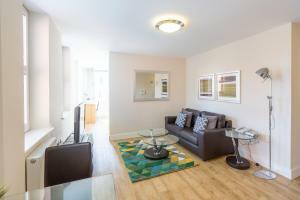 Good location in terms of access and local amenities. 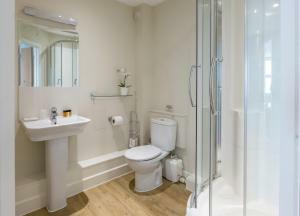 Great amount of facilities within the property. Modern, pleasant, comfortable and clean room. Good kitchen facilities. Extremely convenient location. Excellent location, a few hundred yards from town and restaurants. The arrangement with self check-in worked very smoothly and there is a small amount of parking behind the apartments. The apartment was very well equipped and a good size for a studio. Very comfortable bed, soft sheets, nice and clean. Clean bathroom, everything I needed. Nice TV, didn't need anything else and a great location. They do charge a £150 deposit and I was worried it would not be refunded. But, if you are a decent person and a careful, genuine traveller who naturally looks after other peoples property, this will be refunded to you. They will send you emails with instructions, and as long as you follow each instruction, you will not go wrong. Coffee and Biscuits provided which I didn't use but nice clean kitchen and facilities, it was good to know all this was available to me. Great WiFi - very good communication with booking staff. In the city center, closed to restaurants. Appartement is clean. Clean , Spacious , Facilities were excellent and location was perfect for shopping/nightlife in and around the city center. Happily stay here again..
Great all round apartment and will definitely stay again. The property is good, room is very comfortable and kitchenware is well equipped. But payment was a little bit complicated so it took me a long time to finish the payment and got the information of entering the property. Lock in a great price for Central House – rated 8.8 by recent guests! 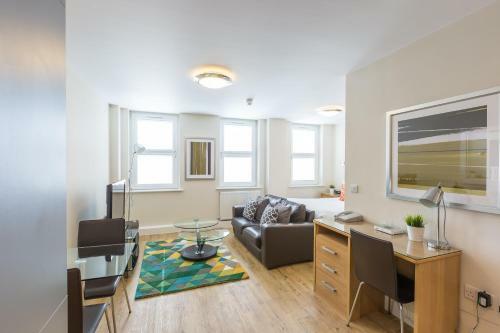 Central House This rating is a reflection of how the property compares to the industry standard when it comes to price, facilities and services available. It's based on a self-evaluation by the property. Use this rating to help choose your stay! Located in the heart of Camberley town center, Central House offers purpose-built apartments and suites with fully equipped kitchens and free Wi-Fi. Legoland Windsor is 12 miles from the property. A living area, TV, DVD and sound system is provided in each Central House apartment and suite, as well as a fridge, dishwasher and washer/dryer. A weekly housekeeping service is provided, which includes fresh linen and towels. 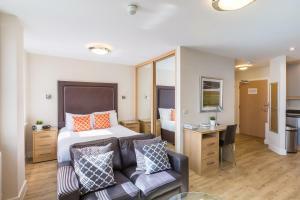 Camberley Rail Station is a 3-minute walk from the property and offers links to London Waterloo, Ascot and Guildford. Restaurants, Camberley Theater and a cinema can be found within Camberley town center. 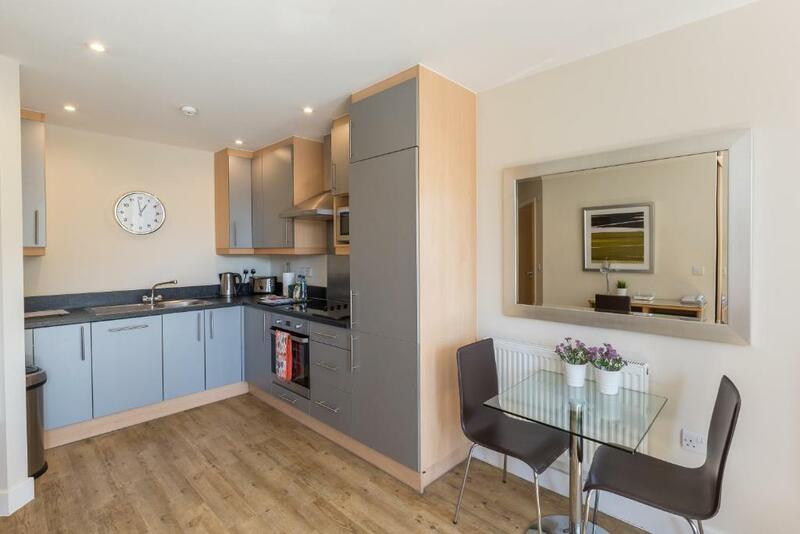 This property also has one of the top-rated locations in Camberley! Guests are happier about it compared to other properties in the area. 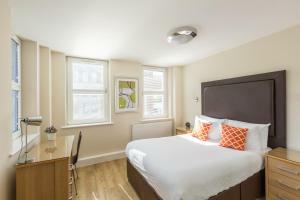 When would you like to stay at Central House? Free unlimited broadband internet, an iPod docking station and a fully equipped kitchen are featured in this suite. A living area with TV, DVD and sound system is also provided. Please note that the parking available cannot accommodate vans or commercial vehicles. Please note this apartment type cannot accommodate an additional bed. Payment will be charged on receipt of the reservation. Public parking is available on site (reservation is needed) and costs GBP 6 per day. 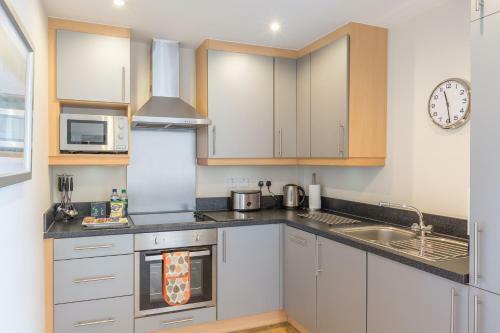 This luxurious apartment features a contemporary, fully equipped kitchen with microwave, dishwasher and oven, a living room area with TV with satellite channels and DVD player and a bathroom with free toiletries, hairdryer and shower. 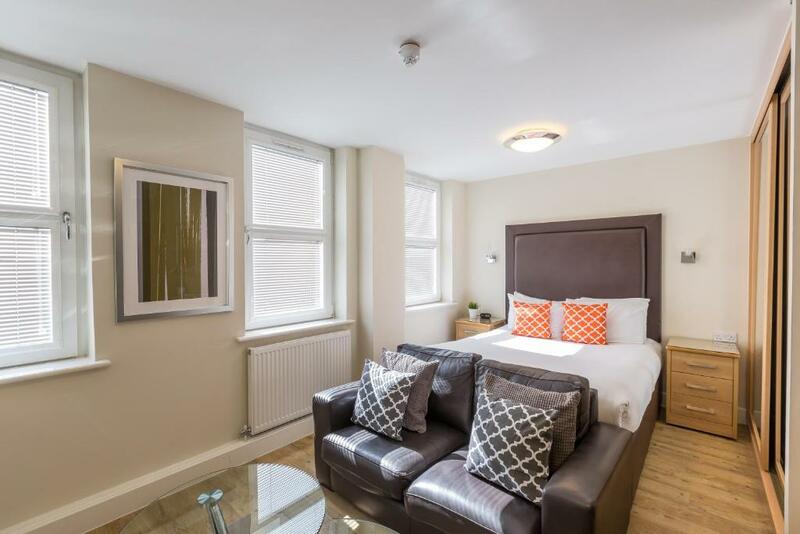 Please note the Deluxe Studio has a sofa bed, and as a result the property is unable to accommodate extra beds. Central House is owned and Run by House of Fisher Services Apartments. This complex has Deluxe Studio and Standard Studio apartments. House Rules Central House takes special requests – add in the next step! A GBP150 damage deposit is required 14 days before arrival (about USD195.14). This deposit will be fully refunded at check-out, as long as there isn't any damage to the property. All children under 2 years are charged GBP 6 per night in a crib. Central House accepts these cards and reserves the right to temporarily hold an amount prior to arrival. Payments will be requested by a secure online payment system. Security questions may be used to verify the payment. Guests must be aged 21 years or older. A security deposit of GBP 150 is required before arrival for incidentals. This deposit if fully refundable upon check-outs and subject to a damage inspections of the accommodations. Guests are required to send a copy of their photo identification for each guest staying at the property prior to arrival as there is no reception located at the property. Failure to send this may result in charges. Check-in times can be fully flexible - however if you wish to arrive outside of the advertised check in times, it is essential that you provide a mobile number and estimated time of arrival. Otherwise your request cannot be met. Please note that upon reserving an apartment with House of Fisher, the property requires the registered address of the cardholder. Car parking is available per apartment booking, please note no vans or commercial vehicles are permitted. Please note that the full amount of the reservation is due before arrival. House of Fisher will send a confirmation with detailed payment information. After full payment is taken, the property's details, including the address and where to pick up the keys, will be sent to you by email. A damage deposit of GBP 150 is required. The host charges this 14 days before arrival. That's about 195.14USD. You should be reimbursed on check-out. There was an odd stale smell that pervaded the flat, which stayed around even after opening the windows for a while. The bathroom also had a sewage smell. The shower wasn’t completely clean, and the bathmat was wet upon arrival. The most overlooked part of the property is the curtains, or lack thereof. Office style metal blinds are used instead which is a very bad idea. Not only are these liable to malfunction and breaking, but do very little to block out light. Why people insist on this style baffles me. Despite turning all the radiators off, the flat was extremely warm. Opening the windows is not ideal as the flats are situated right next to a main road, and therefore very loud. The communication with staff is a little cold and, though professional, isn’t exactly welcoming. Instructions and directions were poor. Unfortunately, I regretted my stay. very convenient and almost home from home. No curtains at the property and the blinds were too thin, so street lights very bright in the room. Also the noise from the traffic took a while to get used to, especially at night. I wish they'd been a way of choosing a room at the back of the building. Coffee maker does not exist despite it saying it does in the visitors book. There was quite a bit of traffic noise and I really didn't like the noise from the water pump anytime I or anyone in the apartments nearby flushed the toilet or ran the taps. There were a lot of emails and difficulty making contact to organise the room. I was not aware that I would receive confirmations for booking and parking on my private email so did not look for them initially. I had three emails to arrange parking and then had to ring an after hours number to ensure that I would not get a fine. Parking was around the corner reasonably close but a little dark and isolated. The room fronted onto a busy road and was quite noisy from about 5.30 am. Honestly? It was so good that I can't think of anything in particular. If I really had to say something, as I checked-in, getting the key out of the locked box was a bit tricky at first, but a bit of perseverance was all that was required. Early morning, every time I used the shower the pump went on and I was worried that at that time of the morning I was disturbing others. However, these are very very minor points and I was so happy with my experience. This was my first time staying in an apartment like this and I was apprehensive as to the outcome, but I would happily repeat this. The apartment is in front of the road and is very noisy. There are very few equipment in the kitchen . One of the power supply in the kitchen triggers systematically the switch off of all electricity in the apartment. On arrival very difficult to reach guest services, Phone call just dropped - message like number not in service. The number was right and hit voicemail. The apartment extremely noisy, the windows did not stop traffic noise, or even people chatting below in the street. The apartment was not as clean as I would expect, if it was a hotel room I would have asked for another. Mold on the bath/shower wall, mineral deposits behind the sink in kitchen, visible finger prints on cupboard doors, areas around them corner of bed, sofa, etc. just not cleaned - lots of dust/allergists. Lights out in kitchen, maintenance came out, couldn't fix it needed to replace all lights. Car Park a real challenge to park my rental. Location was good in the center of Camberley. Windows in bedroom were slightly drafty with a bit of road noise but the quality of apartment makes up for this!